5 Tips For Cleaning Gym Floors :: My Cleaners London - Only professional cleaning! 1. Use as few products on the floor as possible. Do not throw any and all types of cleaners at the floor in an attempt to solve an issue. This will only result in damage to the finish and/or the wood itself. Use a neutral, low detergent cleaner for any wet cleaning you perform. 2. Make sure you DO wet clean the floor. Athletes perspire. Perspiration, or sweat, and body oils are high in protein and salt which will build up over time. Solvent based cleaners and too little water will not break down the residue and can lead to a dull, slippery floor. Wet cleaning of some type, either mopping or automatic scrubbing combined with the proper wood floor cleaner, will remove these films. 3. Always use an automatic scrubber when possible. (a machine that applies clean solution, scrubs the floor with various pads or brushes and picks up the water with a vacuum system) leave the floor drier and much cleaner. 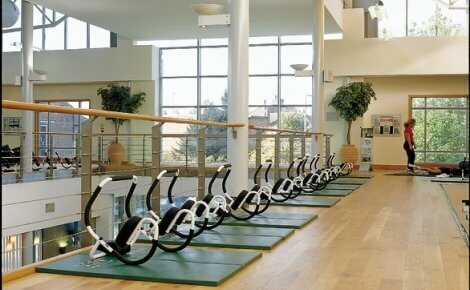 Depending on the size of machine you use, a gym floor can be clean and dry within 15 minutes with very little effort. As long as your floor is in good condition and there is a quality finish, there is no concern about moisture or weight issues when cleaning hard wood gym floors. 4. Protect the gym floor. It can withstand many types of activities. But chairs, certain types of equipment and hard plastic or metal casters will damage the floor. Make sure everyone is aware of your policy for using the floor and take steps to keep the floor protected during events. 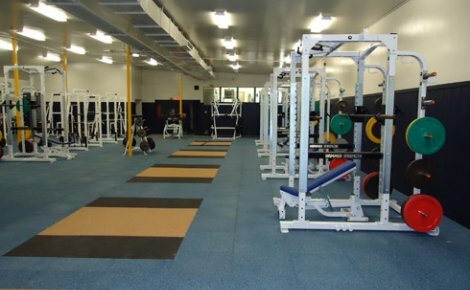 There are many types of gym floor covers and mats that can make protecting and cleaning hard wood gym floors much easier. 5. Gym Floors Do Not Like Dust Mop Treatment. The most important thing you can do to a gym floor to protect it is to remove dust. Traditional methods for dust mopping use a wide frame dust mop that has a treatment applied to it to hold dust. This is extremely counterproductive. The treatments are almost always oil based and leave residue. Even the water based treatments can leave a film behind. These residues trap and hold dirt which will scratch the finish. When combined with the previously mentioned perspiration, they become slippery and will be dangerous. Microfiber dust mops trap and hold dirt without any treatment. They can even be used wet for more in-depth cleaning.